There are a variety of ways to discount opportunity items in Current RMS. Discount all items in an opportunity group at once. Reset discounts across an entire opportunity. Work with discount categories to automatically discount products and services. Items can be discounted when your opportunity's pricing is unlocked and if they're set up as discountable. 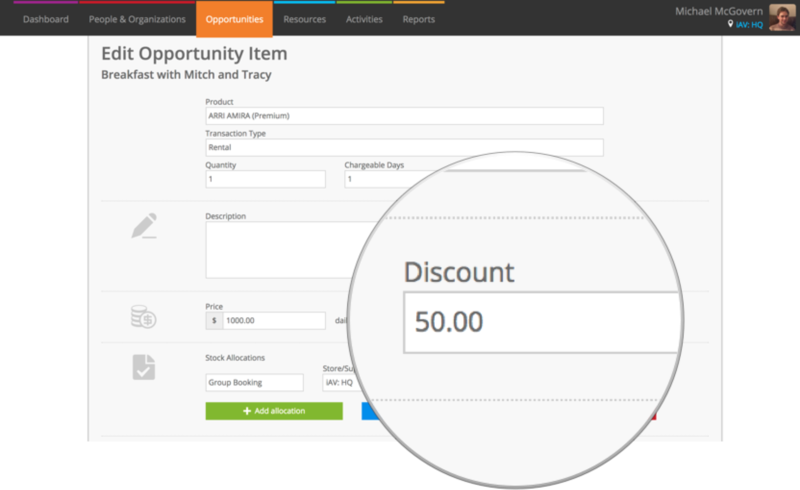 The easiest way to discount an opportunity item is to click on the discount in the list and enter a number. The discount is applied automatically and the charge total is updated. You may also edit an opportunity item to apply a discount. 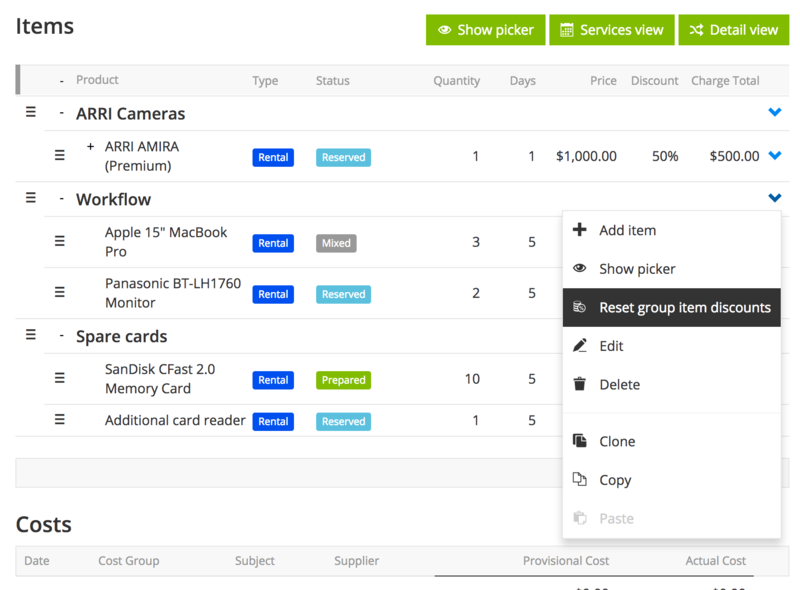 To discount all items within an opportunity group, click the blue arrow to the right of group name and choose Reset item discounts from the menu. To discount all items on an opportunity, choose Reset item discounts under the Actions heading. 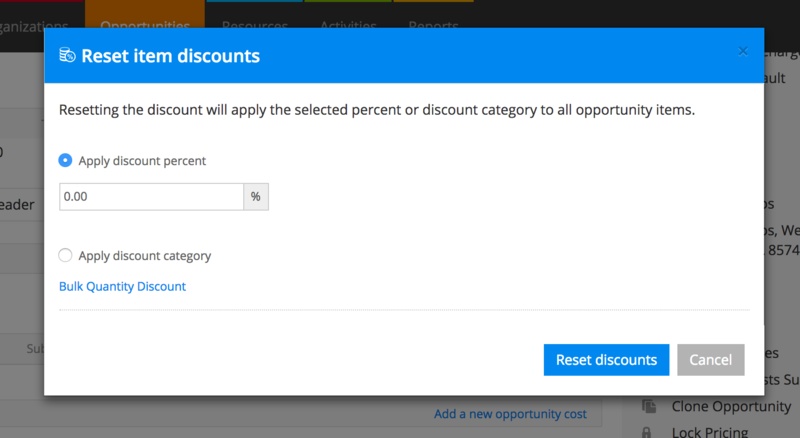 If you get two options, choose “Apply discount percent” and specify the amount that you’d like to discount. 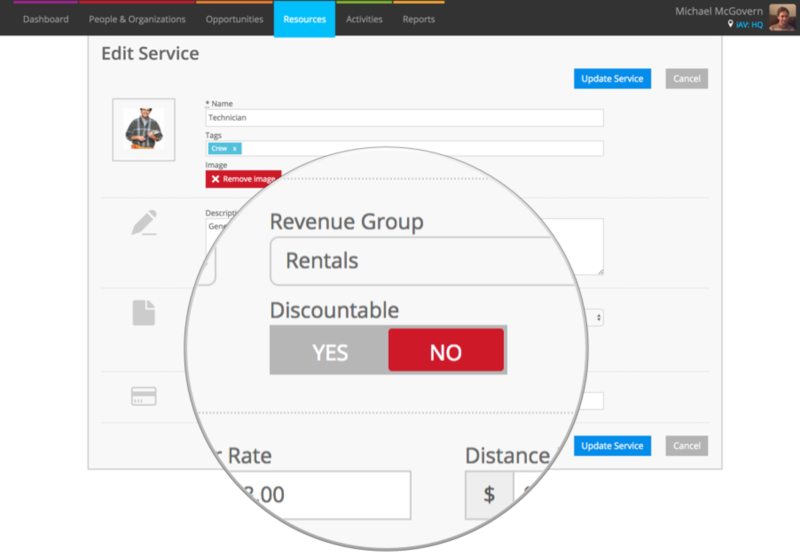 As well as manually discounting opportunity items, you can set up discount categories in System Setup to automatically discount products and services. You can still make changes to discounts on an opportunity when there's a discount category applied. To reset discounts back to their discount category, click Reset item discounts under Actions on the details pane. Then choose “Apply discount category”. Use Deal Pricing under Actions to set a deal price for your opportunity, great for rounding off a figure or when a client has given you a budget. There might be some things that you don't ever discount, for example transport. You can set these products and services up as not discountable to tell Current RMS that these should never be discounted. To do this, head to Resources > Products or Resources > Services and edit the product or service using the pencil icon at the top. Toggle the “Discountable?” slider to NO. Current will ignore non-discountable products and services when applying discounts. If you try to manually specify a discount on a non-discountable product or service, the system will let you know that's not possible. How do discounts show on my document layouts? All of the document layouts that come with Current RMS display data in different ways. Quotation layout 6 is a great for showing discounts – a discount percentage is provided for each line where there’s a discount and the discount is totalled at the bottom of the page. Quotation Layout 5 is a package quotation that shows a total discount, too.